Nazz Nazz recorded in Los Angeles, was a more consistent album and arguably the band's best. It was originally planned as a double album, but relationships within the group, particularly between Rundgren and Mooney were beginning to deteriorate to such an extent that only a single album was possible. 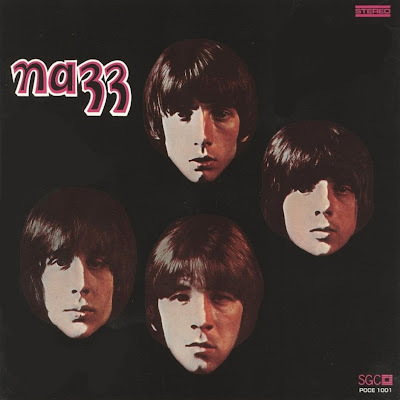 (Nazz III was later released after the band split and made up of left overs from the earlier recording sessions.) Opening track, Forget About It was a cohesive, melodic number. Not Wrong Long was the band's third U.S. single - the final one to be released in the UK. Under The Ice and Rain Rider were further examples of their heavier brand of rock. Gonna Cry Today and Letters Don't Count were melodic ballads, whilst Meridian Leeward was a rather strange number about a piloting human-eating pig. The final track, an eleven minute extravaganza entitled A Beautiful Song, married together all of The Nazz's musical styles as well as many of the influences on them. The album was not released in the UK, although all three Nazz albums were reissued by Rhino in 1983, making original SGC copies of this and the third (US only) album much sought-after by collectors. Nazz III is not as good as the first two albums. It lacked the consistency of their second one, but had its moments. It contains quite a good version of Paul Revere's Kicks and a number of rock ballads, such as Only One Winner, Resolution, It's Not That Easy and You Are My Window, on which Todd sang vocals, but lacks any killer cuts. Indeed, the best of the harder rock numbers Christopher Columbus was written by Van Osten rather than Rundgren. When Todd Rundgren left in 1970 he was replaced by Rick Nielson and Tom Petersson who were later both members of Cheap Trick. Thank You for restoring Oleg. Thanks a-lot for this great album!! !